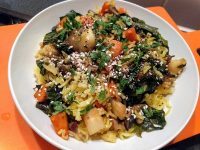 Still making some great discoveries with the vegetable box membership… I am so impressed by that as I was not expecting so many things to discover as I am really fond of cooking and I like to try new things (before the membership). 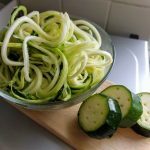 Last week, I have two things that surprised me. 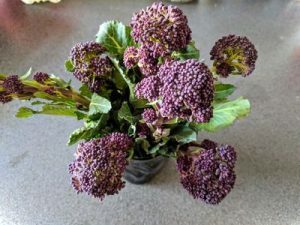 The second one was the broccoli, it was not the usual big green broccoli, the one that I get were looking more like flowers than broccoli. 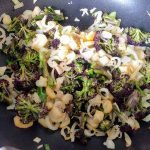 I decided to use the top part of the stir-fry and use the leftover for making some delicious pesto. 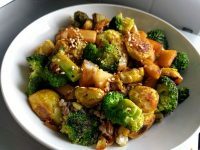 In this stir-fry, I also decided to have some been sprout, the whole combination was really delicious. 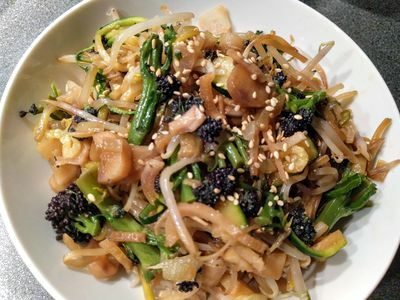 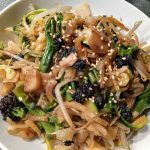 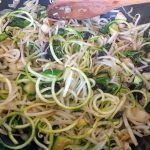 How to make a Stir fry with salsify, broccoli, courgette, and beansprout on a layer of wild rice?